Just three kilometers from the tip of the boot ... and yet so far away! Sicily is a land of tradition and gastronomy, adored by the rest of Italy for langurous holidays under the sultry Mediterranean sun. Its long and complex history is no less fascinating, with vestiges of its Arab past hiding in plain sight. Whether you dream in pristine beaches or fascinating volancoes, Sicily is a Mecca for lovers of travel. From the fiery top of Mount Etna to the beaches of the Aegadian Islands, Sicily will never cease to amaze. Temples, acropolises and other artifacts dating back to ancient Greece will delight lovers of archeology, whilst Etna, the highest active volcano in Europe at 3,350 meters high, offers hiking enthusiasts impressive and challenging hikes. Those fond of walking should head for the island's hinterland, with a wonderful landscape of rolling hills and mountain ranges ruled over almost entirely by herds of sheep. Though Etna is the region's most famous volcano, that does not mean it is the only one in the archipelago. Among the many other volcanoes, you should see Stromboli and Vulcano. The first is located on the Aeolian Islands and is gives a perfectly conical top to the island that bears its name. Among the most active volcanoes in the world, its spectacular eruptions, when they come, are particularly violent. The second, which is also located in the Aeolian archipelago, now only emits steam and volcanic gases, particularly sulfur, but still makes for a beautiful landscape. For those who love to relax there is plenty of choice, from long golden sandy beaches to fishing harbors, where you'll find the most authentic cuisine to wash down with wonderful wine. Between the province of Siracusa and Ragusa, you'll find a host of great beaches, jammed in between quaint fishing villages, which follow one after the other. Whether for a long weekend or a week-long stint in the sun, the island can provide solace, but for a fairly comprehensive tour you'll need at least a couple of weeks. Most choose between the eastern part of the region, including Messina, Catania, Siragusa and Regusa; or the western half, taking in Agrigento, Palermo and Trapani. Travellers looking for authentic flavours have it easy in Sicily, with a myriad of typical restaurants to choose from where meals cost little, and some of the best street food in the world. Add to that some of the most impressive archaeological and historical sites in the Mediterranean and you have a true island paradise within easy reach of home. Sicily is larger than many visitors think, and planning to visit it all in a week is difficult, if not impossible. If you have any period less than two weeks, try focusing on a limited area of ? ?the island, or choose a theme for your visits, whether it be architecture, beaches or hiking spots. The most beautiful beaches in Sicily are found on the east coast, close to Taormine, and along the Gulf of Castellammare, between Monreale and Capo San Vito. If all you want to do during your holiday is relax, opt for one of the seaside hotels, where you are just a stone's throw away from the beach. 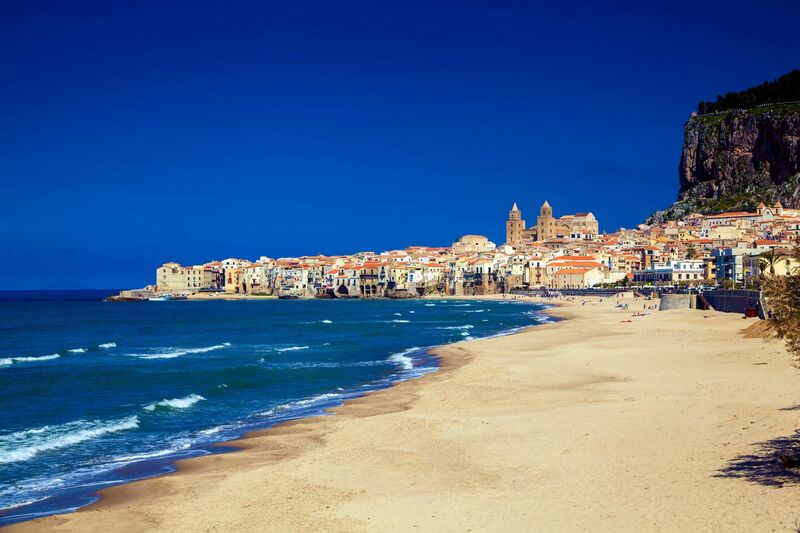 If you like hiking, try Cefalu. This charming fishing village sits between the sea and the cliffs and is wonderful to explore even as a daytrip, but head inland behind Cefalu and you'll find wonderful routes and refuges if you plan on spending the night. 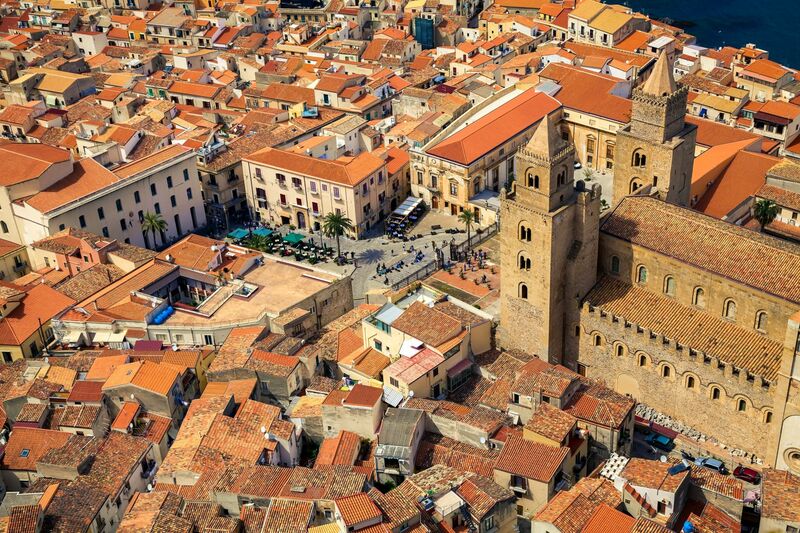 Whatever your plan for visiting Cefalu, set your alarm and go early in the morning to take advantage of the best light and avoid the masses of tourists that come ashore later. History enthusiasts can take advantage of the many sightseeing tours that visit, for example, the Valley of the Temples, as well as the cities of Palermo and Catania which both hold fascinating ruins. +The numerous and varied hotels. +A very rich historical heritage. -The high amount of tourists in the peak season. As there are many practising Christians, Sicily has kept its tradition of processions and numerous religious celebrations that mark the Catholic calendar. If your trip coincides with Easter, Ascension or Pentecost, do not fail to visit one of the small village churches. You will be amazed by the crowd gathered and the friendly and warm atmosphere that prevails during those celebrations. One of Sicily's main charms is undoubtedly its cuisine. Start with the antipasti, a varied appetiser made of seafood, marinated eggplants, artichokes and herrings soaked in oil. Then try the pasta, lasagna or the countless types of raviolis. For your main meal, choose something with seafood like swordfish, bream or mackerel, or a meat-based dish with either lamb, stuffed veal shoulder or grilled beef. If you wantan authentic Sicilian pizza, order the classic margherita with just tomato and mozarella. As for wine, do not forget to try the marsala. Find weekly weather forecasts for Sicily . Different criteria make it possible to predict with precision the best time of year to go to Sicily . A comprehensive weather score, made up of temperature indicators, bad weather predictions, sunshine levels and wind speeds, will allow you to choose the activities best suited to the weather conditions and therefore make the most of your holiday in Sicily . You can take back home gourmet specialties such as olive oil, sauce and condiments, dried pasta, honey, panettone and almond biscuits. Fans of Italian fashion will find undoubtedly find something they like among the luxury designer brands like Gucci, Moschino or Prada. Coral jewellery and ceramics are also widely available and make for perfect gifts and keepsakes. Shops are open from 9:00 am to 1:00 pm and 3:30 pm to 7:30 pm during the week. Our journalists' reviews for you 44 hotels Italy . Take a look at our hotels, their facilities or their value-for-money score according to your departure dates so that we can find the best offer to suit you Italy . Book a hotel Italy it's never been so simple !